This photo was taken on December 20, 2015 at 4:47 PM. The location was in north central Virginia. The "Take It!" came as I was leaving the great workshop of my friend and consultant, Mark Rohr, who is both an artist and a "get into the nitty gritty of any job that needs to be done," type of individual. I was/am very fortunate to have him agree to help me in producing the wooden part of a product that I hope to soon place in the market. No matter what I take to him, he seems to be able to suggest enhancements or modifications that take what ever it is, to another level. The above having been said, I was on my way home, and was of the mind set to make it as quickly as possible, when I happened to look briefly to my left at this setting. It brought me to a halt. It had "Slow Down" written all over it. 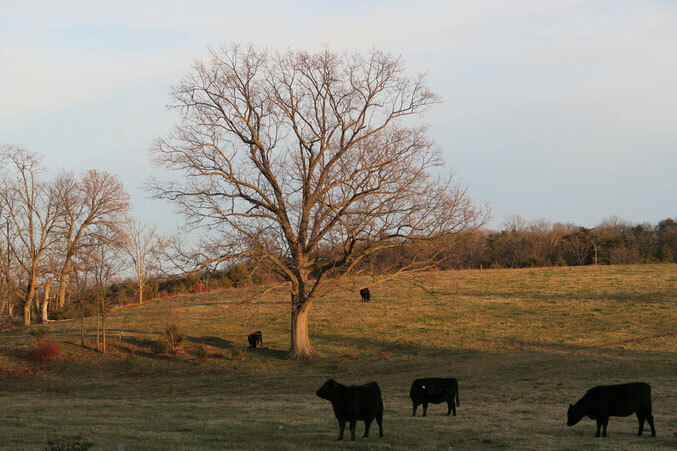 Somehow the shadows from the late afternoon sun matched with the ever so slow moves of the cattle seemed to be a peaceful reminder to engage in that ever available gift of awareness of our surroundings. I was able to take the photo through the open window of the car, and be on my way. While I did make it home in near record time, the journey had an ease to it, that seemed to defy fatigue. Here is hoping you have some country setting nearby, that you can get out into on occasion and gather some calm, to take home with you. Happy New Year Everyone! We here at Whutzzat hope you all have a great and safe holiday. May 2016 bring even more joy and happiness into your lives! Our lunch group wishes you a great New Year too Bruce, and all the joy and happiness you're sending our way we are sending right back at ya!!! When I first glanced at the photo's I thought the cows were silhouettes. I did a double take to realize they were actually just really black cows. Mid to late December and no snow in site. Is this normal? I thought that area actually had snow during the winter? Oh Boy! A couple weeks ago you posted a picture that I said would have made a great desktop background. This one takes the cake, I love this photo. happy new year whutzzat folks! cool pic btw... i really like it when websites take the time to acknowledge their users during holidays, its a minor thing to notice but its not something i overlook. oh im a big fan of the share buttons you integrated intoeach photo, talk about a real convenience.